(l-r) Lady Gaga and Andrew Dice Clay star in A STAR IS BORN. ©Warner Bros. Entertainment. CR: Clay Enos. One of the biggest criticisms against the entertainment industry in recent years has been the lack of original ideas hitting both the big and small screens. Whether it’s competing motion pictures with similar plots, live-action remakes of beloved animated films or classic (and not-so-classic) TV series being revived or rebooted, it seems like Hollywood execs have just about run out of original ideas. That being said, one of the most popular stories Hollywood has retold over the years is that of “A Star is Born.” Originally released in 1937, writer-director William A. Wellman and writer Robert Carson’s story of an aspiring actress (Janet Gaynor) and the fading movie star (Fredric March) who helps launch her career has been remade three times with one major alteration to the plot to fit the strengths of its remakes’ leading ladies: instead of being an aspiring actress, the film’s protagonist is an aspiring singer. The first remake, which starred Judy Garland and James Mason, was released in 1954 and was followed in 1976 by a second remake starring Barbra Streisand and Kris Kristofferson. Now, more than 40 years since the third “A Star is Born,” Bradley Cooper (“The Hangover,” “American Sniper”) makes his directorial debut trying to bring something new to one of Hollywood’s most revisited tales. Cooper also stars in the Warner Bros. film as Jackson Maine, a self-destructive country musician who falls in love with a young singer named Ally (Lady Gaga) after stumbling into the drag queen bar she’s performing at one night looking for some alcohol. The two quickly fall in love, but as Ally’s career starts to takes off, Jackson finds himself succumbing to his inner demons and going on a downward spiral that even the love of his life can’t save him from. While much has been made of Lady Gaga’s performance in the film, the truth of the matter is audiences should be going gaga over Cooper’s powerful performance. Cooper is completely captivating in the movie, from his jaw-dropping vocals (who knew he could sing?) to his realistic portrayal of someone struggling with addiction. His chemistry with Lady Gaga is also undeniable, which makes their characters’ hurried romance seem a bit more believable. Anyone who has followed Lady Gaga’s career knows she’s talented, and “A Star is Born” only further cements that fact. Gaga’s received a lot of critical acclaim for this role—all of which is well deserved—but longtime fans might leave the theater wondering if some of that acclaim stems from the fact many people dismissed the pop star in her earlier years as all flash, no substance thanks to theatrics like her infamous meat dress. With “A Star is Born,” Gaga continues to prove herself as someone far more talented than just the next Madonna, showcasing a wide range of emotions flawlessly. Expect to see the Golden Globe award-winning actress for “American Horror Story” in far more acting roles in the future. Cooper and Lady Gaga aren’t the only actors who shine in the film, either. Comedian Andrew Dice Clay is nearly unrecognizable as Ally’s proud papa, and fellow comedian Dave Chappelle delivers a memorable—albeit brief—performance as Jackson’s childhood friend, Noodles. Sam Elliott (“Road House,” “The Ranch”) also steals the spotlight every chance he gets as Jackson’s older brother/manager, Bobby, who is getting tired of watching his baby brother follow in their alcoholic father’s footsteps. 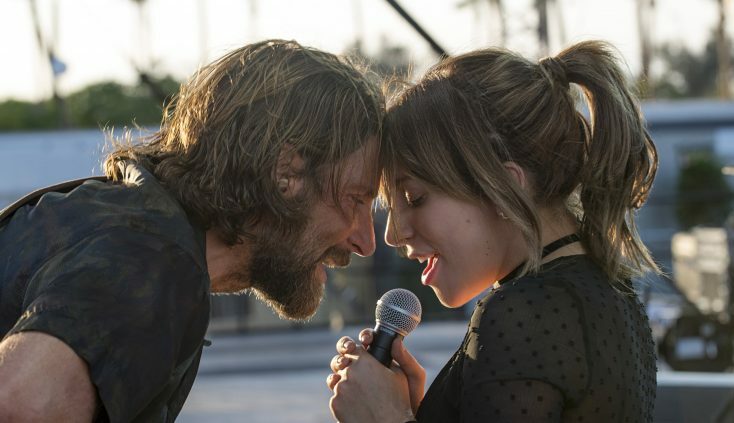 Although the jury is still out on if “A Star is Born” will receive any acting accolades at next year’s Academy Awards ceremony, as of now, audiences can’t help but feel that Lady Gaga (who also served as a songwriter on the film) at least has the Oscar for Original Song in the bag with her and Cooper’s catchy duet, “Shallow.” The song, which has been featured prominently in the movie’s trailers, is one of Gaga’s best, and showcases both her and Cooper’s vocals beautifully. While the entire soundtrack for “A Star is Born” is strong, “Shallow” is definitely the track viewers will be humming long after the credits roll. Cooper, meanwhile, does a commendable job as a first-time director, although there are a couple of rough patches in the film. While some critics have praised “A Star is Born” as perfect, that’s not completely true, as the 135-minute film runs a little long and has a couple of confusing edits that the characters later have to explain. Still, Cooper shows a lot of potential as an actor turned director, with brief moments of Clint Eastwood-type brilliance—which is ironic since Eastwood was originally considering directing the film and actually met with Cooper to star in it before the project lingered in developmental hell for several years. Probably “A Star is Born’s” greatest strength, though, is the fact that younger moviegoers likely haven’t seen the previous incarnations, the most recent of which was more than 40 years ago. This helps the movie stand on its own, so viewers are truly captivated by Jackson and Ally’s love story and heartbroken by Jackson’s plight. The writing might be on the wall for how Academy Award winner Eric Roth (“Forrest Gump”), Will Fetters (“The Lucky One”) and first-time screenplay writer Cooper’s story ends (yes, he co-wrote the script, too), but it’s still an emotional roller coaster getting there.